Posted January 20, 2003 in Articles and Ecology. Winter is the time of year when everything seems to slow down in the Boundary Waters area. It is much quieter in the woods since most of the birds have left for warmer climates where food is more abundant in the winter. Animals o various sizes, from black bears to least chipmunks, have retreated to their dens and are silently spending the winter in hibernation or near-hibernation. The Pukak forms along the ground and is insulated by the overlying snow. When we have a winter like last years, with a combination of extreme cold and deep snow, the animals that remain active have trouble getting around and difficulty finding enough food, staying warm, and surviving until spring. Some animals, particularly deer, can suffer high mortality over the winter. Even animals well adapted to deep snow, like moose and snowshoe hare have difficulty getting through the winter. When you snowshoe or ski through the woods in mid-winter, the tracks of a variety of animals are very apparent. It’s always exciting to encounter the large tracks of moose, deer and wolf. In some areas, the tracks of snowshoe hares and red squirrels leave intricate patterns in the snow. Evidence of a wide variety of predators: including mink, weasels, marten, fisher, fox and even the occasional lynx, may be seen. What is startling is the scarcity of tracks of small mammals. Tracks small enough to belong to a mouse, vole or shrew are seldom seen. When their tracks are found, they usually skitter across the snow for a short distance and then disappear into the snow. These small mammals are the most common mammals in the Boundary Waters area. A study of the small mammals of Quetico was conducted in the mid 1970’s by David Nagorsen from the Royal Ontario Museum. His team found two species of chipmunks and thirteen species of land mammals smaller than chipmunks. They located and identified three species of mice, five of shrews, four of voles, and just one species of lemming. It seems surprising that since at least fifteen species of chipmunks, mice, shrews, voles, and lemmings live in the BWCAW and Quetico, that evidence for them is so hard to find in the winter. The small size of these mammals makes them very susceptible to the cold, and they have to find a way to avoid the cold if they are to survive our long winters. Most of the predator tracks that we see in the winter are made by animals searching for these plentiful but elusive small mammals. Where do they go that makes finding sign of their existence so hard to find, and how do they get through the winter? Some of them simply hibernate or spend most of the winter in insulated nests. There are three known species of mice in the Boundary Waters area. Two of them, the woodland jumping mouse and meadow jumping mouse, are primarily seed eaters and they spend the winter in hibernation. The most common mouse, and the second most common small mammal in Quetico, is the deer mouse. Deer mice, and both the least chipmunk and the eastern chipmunk, store up food in the fall and spend the winter in insulated nests where they huddle together for warmth and eat their stored food. They also occasionally venture out to collect seeds and to seek out any other food they can find. There are, however, ten species of shrews, voles and lemmings that are active throughout the winter. They have found a way to use their small size to their advantage. The snow, one of the hazards to larger animals, becomes an aid to their survival. They literally use the blanket of snow on the ground as their blanket; it is the insulation that protects them from the cold. Their winters are spent under the snow, in a weird and fascinating place known as the pukak. Pukak is an Inuit word for the complex layer of ice crystals and open space that forms at the base of the snow pack. The formation of the pukak begins with the first snowfall that covers the ground vegetation. Herbs and other small plants keep some of the snow from coming in contact with the ground and this causes small openings or cavities to form. When the snow reaches a depth of about one foot, the temperature of the pukak layer stabilizes at just a degree or two over freezing. The snow above the pukak layer insulates it from the cold air above and traps some of the warmth that always radiates from the ground below. The warmth from below causes the formation of ice crystals and the natural small openings and tunnels formed by the vegetation are enlarged. These natural openings are joined together to form tunnels by small mammals in the pukak. The tunnels allow these animals to travel long distances under the snow. They undoubtedly use these tunnels to locate food. Seeds keep well at pukak temperatures and some herbs stay succulent and green all winter long. The pukak forms where there is sufficient ground level vegetation to allow openings to form. Where there is little or no vegetation, such as on the ice surface of ponds and lakes, no pukak layer forms. Pukak layers vary considerably, depending on the habitat and the conditions as the snow accumulates. You can check out the pukak by taking a shovel and digging in the snow down to the ground. Make the cavity big enough so that you can crouch or lay down and see along the ground into the pukak. A flashlight will show the natural caverns and openings caused by the vegetation and heat from the ground. A mowed lawn will have virtually no pukak but most areas with undisturbed vegetation will have a pukak layer. When the snow reaches a depth of about a foot, even the mid-day sun causes only a faint glow to reach the pukak. Because of the dark, animals in the pukak have to rely mainly on their hearing and sense of smell. It is always relatively warm in the tunnels, but it is also damp and dark. A wide variety of insects and small mammals inhabit the pukak. Many insects overwinter in the pukak. When the snow accumulates over them, they exist in an environment just a few degrees below freezing. This would be a safe place to spend the winter except for the small mammals, primarily shrews, that eat insects and insect larvae and are active in the pukak all winter. When we think of mammals in the Boundary Waters area, shrews, mice, voles and lemmings are definitely not the first animals to come to mind. The variety of small mammals in the pukak, however, are as intriguing as they are small. The smallest mammal in our area, the pygmy shrew, is also the smallest mammal in North America and among the smallest mammals in the world. It is only 3 to 4 inches long, including the tail, and weighs less than a dime. Despite its size, this tiny mammal is a predator. It eats mainly beetles and other insects, but also preys on spiders and earthworms. Shrews generally have the smallest bodies and the fastest metabolism of all the mammals. The pygmy shrew, being the smallest, has the highest metabolism of all. It’s heart beats at the astonishing rate of 1500 beats a minute. It has to eat almost constantly in order to maintain its high metabolic rate, and shrews can starve to death after only a few hours without food. The short-tailed shrew is another pukak inhabitant. This large and fairly common shrew is unusual because its saliva is toxic, allowing them to kill prey that is larger than themselves. They have been known to kill garter snakes and even young rabbits in the summer. 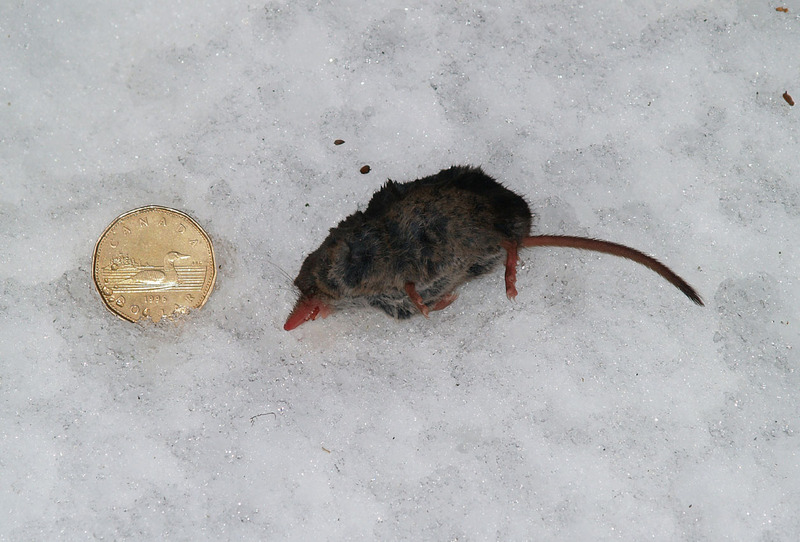 A dead shrew found on the surface of the snow near French Lake in March. The cause of death is unknown. The most common shrew in Quetico, and the third most common small mammal, is the masked shrew. It is found in large numbers in most habitats but seems to prefer wet meadows and acid bogs. Like all shrews in our area, it is thought to mainly eat insects, but has a varied diet that is known to include vegetation and the young of mice, voles and other shrews. These fascinating and poorly understood animals roam the pukak all winter, preying on insects and the occasional small mammal. The pukak is an ideal place for shrews in the winter because its constant temperature is only a few degrees below freezing. The darkness of the pukak is not a problem for shrews since they have poor vision and rely to a large extent on their sense of smell. The most common mammal in Quetico and the BWCAW is one that, in spite of their large numbers, are only occasionally seen in the spring, summer or fall. Since they inhabit the pukak layer, they are virtually never seen by humans in the winter. The redbacked vole is a plump, mouse-sized animal with a broad chestnut stripe that runs from its forehead to its rump. Like other voles, the closely related lemmings, and shrews, they are active all winter in the pukak. They are extremely important to the ecology of this area because of their abundance. 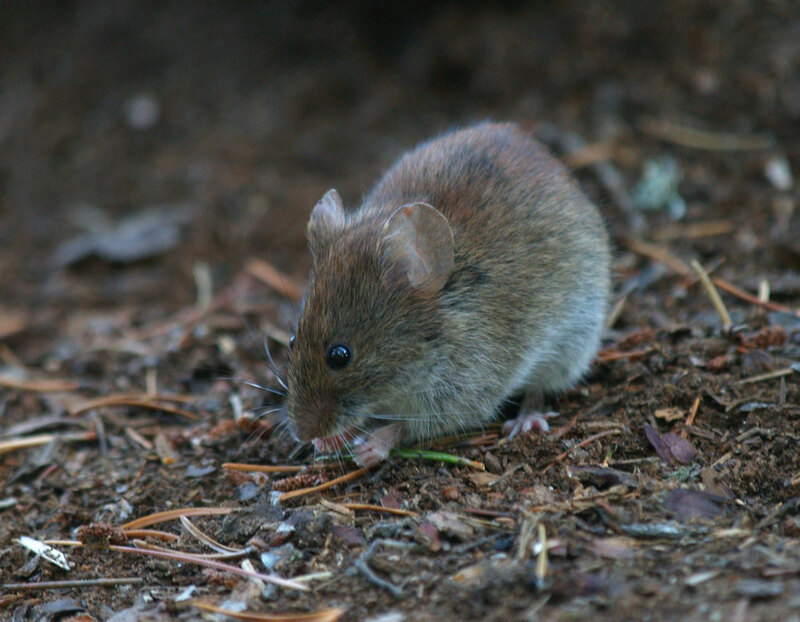 A redback vole on a Quetico campsite in September. Although red-backed voles were just one of fifteen species of small mammals found in the Quetico study, they comprised about half of the total animals captured. These voles were found in all of the habitats studied, everywhere from wet meadows to dry upland slopes. Red-backed voles and other small mammals are near the bottom of the food chain and are the main sources of food for many predators. There are also three other species of voles in Quetico; the meadow vole, the heather vole and the rock vole. Each species is found primarily in specific habitats and they are far less common than the red-backed vole. Along with the Boundary Waters only lemming, the southern bog lemming, they are important inhabitants of the pukak. Populations of these small mammals fluctuate greatly from year to year. They can quickly recover from low populations because they can have many litters in one year and commonly have five or six young in each litter. The females of some vole species are ready to breed when they are just six weeks old. These high birth rates are balanced by a high mortality rate. Most shrews, mice, voles and lemmings are thought to live only about one or two years on the average. These abundant animals are an important food source for weasels, red fox, and martens, as well as for a variety of hawks and owls. The populations of these varied predators are, to a large extent, dependant on the populations of the small mammals that are their prey. Snow, especially deep snow, helps to protect pukak dwellers from large predators like lynx, red fox, and wolves. However, red fox have been observed jumping into the air and coming down on their front feet to pin mice and voles to the ground. They apparently use their acute hearing to precisely locate these small mammals below the snow and are able to capture them in the pukak even though they can’t see them. Even smaller predators, like marten and mink, are not small enough to hunt in the pukak layer. Weasels, however, have the extremely long, slender bodies that allow them to follow their prey through the narrow runways under the snow. Unlike the small mammals they are hunting, weasels are not permanent occupants of the pukak. They can enter or leave the pukak by simply burrowing through the snow. They also use the ventilation shafts that are built by pukak dwellers in order to get fresh air down to the pukak. The weasels’ slender bodies allow them to use these shafts to gain easy access to their prey. Some winters have very little snow, and those are the hardest on pukak dwellers. If there is only a few inches of snow, the pukak does not fully develop since the heat from the ground is lost into the air instead of being trapped in the snow by a thick insulating blanket. If there is less than a foot of snow, the full insulating value of the snow is not felt and the extreme cold of mid-winter can penetrate into the pukak. During winters of average or greater than average snow depth, the most perilous times are usually at the beginning and end of winter. Early winter, before enough snow has accumulated, and late winter, when most of the snow has melted, are times when cold is the greatest threat. An early or late winter temperature of 0 F. is much harder on pukak dwellers than -40 F. in mid-winter when the snow depth protects them. Another dangerous time is during periods of very warm weather when the rapid melting of snow can cause flooding of the pukak. 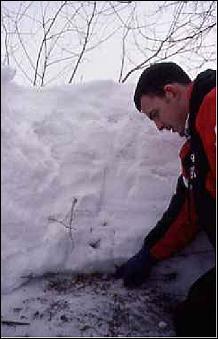 This forces animals out from under the snow and they become vulnerable to large predators like marten and red fox. Owls and hawks can also prey on animals that were previously hidden by the snow. For most of the winter, and especially during the extreme cold of mid-winter, the pukak has many attributes that are favourable for creatures small enough to take advantage of them. The small mammals in the Boundary Waters area are able to survive our long harsh winters by using the snow to their advantage. They evade the extreme mid-winter cold by using snow as a blanket, and the earth as constant source of low heat. The animals that are small enough to live in the pukak have replaced the bitter wind and extreme cold with a constant coolness. The pukak, like all habitats, also has its limitations. Pukak dwellers are restricted to places where their narrow corridors under the snow can take them. The plant food available in the pukak is limited to what was there at the end of the growing season. Since no new food is being produced to replace what is consumed, the food supply declines throughout the winter. The blanket of snow that protects them from the cold also effectively blocks most of the light from entering their domain. The long winter nights above the snow are expanded and altered below the snow. In the pukak, animals are only vaguely aware of the sun and are oblivious to the stars, moon or northern lights. Although we share the same environment, their winter world is so different from ours that it is hard to even imagine. Need Picture. Need more color. Need good stuff. Was nice to see you and Marie in Grand Marais last week. Tanner was very impressed to meet a real scientist. I’ve just read the Pukak piece and will call it up for him when we babysit on Wednesday. If you’re interested, Orion my son is the blog master of his own blog, but I do a self-directed investments blog ‘within it’. Just click on the Investment tab from the home page. We’re at http://www.oval.ca/blog. Wouldn’t want to live in the Pukak for the next few weeks. Added photos in colour. I think it has good stuff. Really good writing, Jon, a pleasure to read, and yes, full of good stuff. In my own work I call this topic “Volopolis,” as I first stumbled on it (literally) in the spring, snow just melted, all these tunnels and stacks of chopped grass and suddenly it all clicked–voles made this!